One of the most popular representatives of contemporary Ukrainian art – on family, limits of ability and many other things. We don’t travel as much as we want, because painting, the style of my works demands some serious assiduity and decent amount of labor. Recently several exhibitions of my works have been opened in different places at the same time, thus, I had to create many pieces. That is why I don’t work alone – there’s a team of professionals that assists me. This gave me an opportunity to accomplish a large amount of work. Sometimes it takes half a year to create a painting. It’s possible to combine creation and family. In a way it’s even funny and interesting. My children used to pose for me. But I turned to different subjects, I paint different things now, there occurred some objectlessness in my art – more precisely, specificness in objectless space. My artist-wife and I don’t consider each other as competitors, rather as partners in creative interaction. And it’s not a fight – it’s comparison that is my driving force. You just cannot relax. To me, the most interesting part is seeing my ideas being embodied. To understand if the painting makes people feel emotions that I originally intended. The concept doesn’t change often. Usually I am interested in the particular theme, and I try to stick to it. Sometimes it happens that I conceive 20 artworks, but create only 9 – just because it is physically impossible. It may take about a year from the appearance of the idea to implementation of the project. It all begins with a concept, then I create works, and only later I find ways to display them. Something falls out of the project, because I imagined one thing, and got completely different. So the exposition itself very often becomes an unexpected result. Of course, the PinchukArtCentre Prize had effect on my creative life. I got an opportunity to accomplish the projects as big as I could imagine, so I started creating them. Along with the prize I got time, and I allocated it between paintings my own way, and not the way reality demanded it. My trip to London to train with Antony Gormley, and the time I spent in museums provided me with priceless visual experience. It was a truly huge contribution to my education and development. Since then I’ve been getting more opportunities, more offers. And we shouldn’t forget about how important financial support is for an artist. It’s extremely hard to realize projects without it. If an artist is obliged to work somewhere to provide himself with materials, environment for painting and satisfy his basic human needs, he lacks time and energy for implementing his creative ideas. It’s very important for an artist to get support from institutions and galleries in many technical aspects, e.g. in paying for materials, production, delivery and other important things. We’ve got favorite places, e.g. 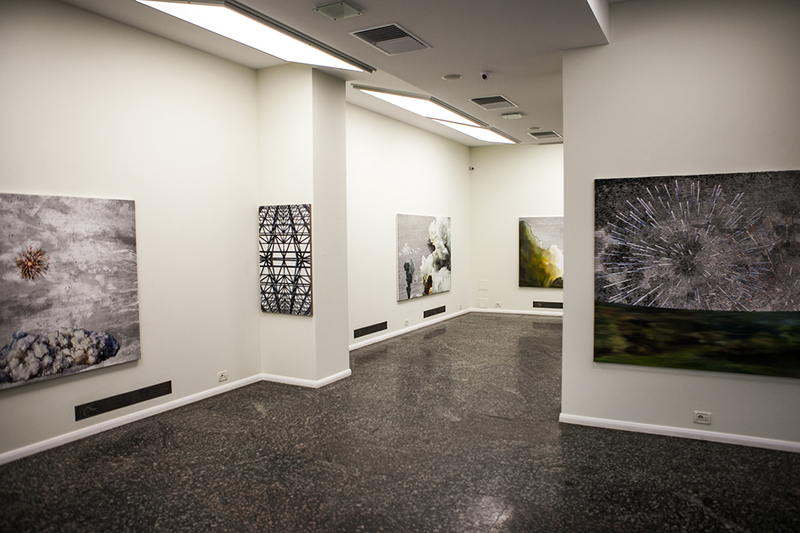 PinchukArtCentre, Mystetskyi Arsenal, Lavra Art Gallery, Dymchuk Gallery, Karas Gallery, Ya Gallery, Shcherbenko Art Centre, Ludmyla Bereznitska Art Centre… Large-scale exhibition spaces like Mystetskyi Arsenal and Modern Art Research Institute at group expositions let audience take in more artists and pieces, choosing something personal, filling oneself with new experience. To me, it’s more difficult with chamber galleries. They should be approached with higher awareness. We have to give credit to galleries and people who work there. It’s a mighty work. You need a lot of patience to be engaged in gallery business. In Ukraine, to open and maintain a gallery, to put up with artists, to promote culture, not only you have to be a professional, but also a restless adventurer and explorer. And speaking of artists, whose works I find interesting, I can give you the names of Danylo Galkin, Nina Murashkina, Hamlet Zinkovskyi, Olya Selishcheva, Roman Minin, Zhanna Kadyrova, Tetyana Malinovska. I always imagine what they are capable of doing and connect it with their previous works. I feel related to some of their pieces. And can’t wait to see what is still coming. I have plenty of ideas and plans. Usually I move in several directions at the same time and, at the end of the day, focus on the thing that excites me the most. In autumn I am opening my large personal exhibition in Kyiv. I am already getting ready for it. I think it will be interesting. And I hope it works out. In addition to business trips we try to just travel. We never skip galleries that exhibit classic art – it’s the starting point for us. Currently we are planning to go to London: the entrance to practically all state and private museums is free there, and they have many good collections. The ability to visit them whenever you want and explore pieces of art gives you a creative impulse and enriches you mentally. Creating art is a luxury and a pleasure. It’s a luxury to do painting. To devote it as much time and as many resources as you want. One can sacrifice a lot for it. Now I understand collectors more and more.